1953 was a pivotal year... or at least the start of a brief pivotal period. For example, it was the first year of Hamilton's new 12/0 sized movements.. the 752, 753 and 754 which replaced the 14/0 size 980, 982 and 982M, respectively. It was also the first year of the Hamilton Illinois branded watches that ushered in Swiss-made manual wind movements as well as the first automatic and calendar models. Pivotal periods are not without churn and one of the models that only lasted a single year was the 1953 Preston. 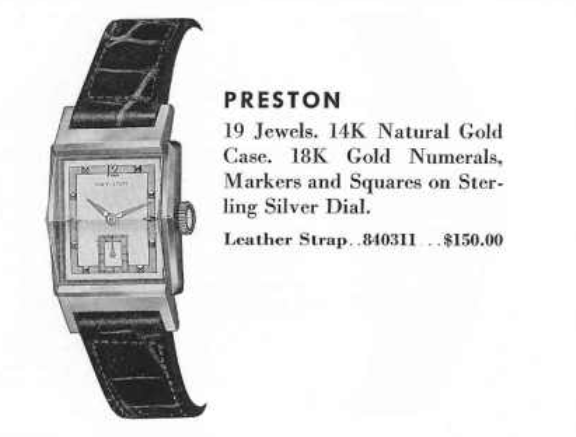 The Preston is unique in that it's one of a few models that featured a beveled crystal. I'm not sure what the purpose was other than perhaps to add a bit of flair of angularity or maybe a bit of bling. Of course, the 14K solid gold case with two-tone butler finished dial with applied gold numerals and markers had quite a bit of bling on it's own. Tucked inside the Preston's case is a 12/0 sized 19 jewel 754 movement This grade was used only in solid gold models and it's virtually identical the 19 jewel 753 grade. It would be replaced in 1955 by the 22 jewel 770 movement. I was fortunate enough to receive a Preston in need of some love from a friend of mine. It's nice to have friends with deeper pockets than I have, as I get to live vicariously through them. It really didn't need much work other than a fresh overhaul. The beveled crystal makes it look like there are two sets of markers at 3 and 9. The beveled crystal stands proud above the case and prevents the case from incidental wear and tear. Although this watch is in great shape and I doubt it got much exposure to wear and tear at all. The dial is a refinish and you have to look very closely to tell. You can see there's a notch on the side by the 3 marker and there's a slight gap between the inner black line and the white border between the 4 and 5 markers. The movement has a dull haze to it, so I suspect it's been a while since this movement has been cleaned and oiled. Other than a little rust on the set lever, the dial-side of the movement looks great. Everything looks bright and shiny after a thorough cleaning. The mainsprings in Hamilton after 1953 are predominantly white alloy "lifetime" springs. They can break, but it's rare. The 754 goes back together just like a 770 does and the hardest part of reassembling it is to get the pivots of all four wheels to line up in the train bridge. It takes patience but it's way easier than reassembling a 748 / 735 movement. Now I can give it a few winds and put the balance back on. The now-running watch goes onto the timer to see how it's performing. Looks great, I'll leave it like this for now as it should settle down after a while. The only tricky part about this overhaul was the minute hand. It was loose. Tight enough to stay on but loose enough that it would move if you gently banged the watch. That would get the hands out of sync, so they would align at 12:00, etc. It had to be tightened. Tightening a hand is a basic watchmaking skill. It's easy to screw up, like everything else, but if you have the proper tools it's not too difficult. The "best way" to do it is with a round punch in a staking set. With the hand centered in the staking anvil and the punch lined up with the hole in the hand, a very gentle whack on the other end will close the hole ever-so-slightly. The freshly serviced Preston looks as good as it did when it arrived but now it's ready for wrist time and the minute hand won't fall off while wearing it. Pretty fancy looking watch, don't you think? Terrific looking watch! Definitely one I would consider purchasing. Great job as always Dan !